If you need a present in a hurry, an E-Voucher is your perfect solution. Just write us an email with the amount you wish to spend and your message. When your payment clears, your friend will get the voucher via email or post with your chosen amount to use in our participating Double One Store. Double One E-Voucher is only available at participating Double One stores. 1. 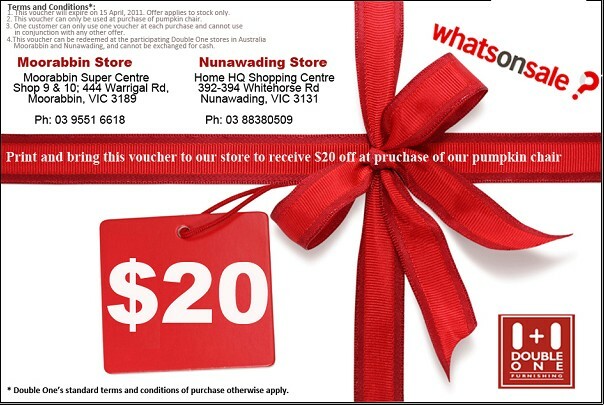 This voucher will expire on 15th April, 2011. Offer applies to stock only. 2. This voucher can only be used at purchase of pumpkin chair. 3. One customer can only use one voucher at each purchase and cannot use in conjunction with any other offer. 5. Double One's standard terms and conditions of purchase otherwise apply.